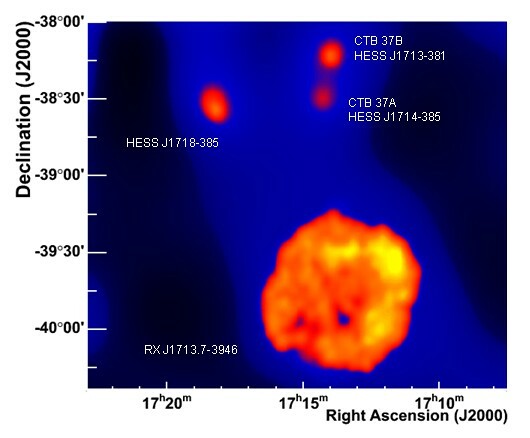 Adaptively smoothed very high energy gamma ray image of the 2.5 degree field showing the large supernova remnant RX J1713.7-3946, and the sources HESS J1713-381, HESS J1714-385 and HESS J1718-385. HESS H1714-385 and HESS J1713-381 appear to be associated with the CTB 37 A and B remnants, also known as G348.5+0.1 and G348.7+0.3, whereas HESS J1718-385 is most likely a pulsar wind nebula generated by PSR J1718-3825. The top image shows the crowded gamma-ray sky near the huge and well-resolved supernova remnant RX J1713.7-3946, with the CTB 37A and CTB 37B supernova remnants and the pulsar wind nebula HESS J1817-385 as additional gamma ray sources. HESS J1713-381 - the main subject of this SOM - was first reported by Aharonian et. al (2006), coincident with remnant CTB 37B alias G348.7+0.3 (Fig. 1). In CTB 37B, only a section of the ~5' radius shell is visible in radio. At a distance of about 5-10 kpc, the age of this remnant was initially estimated to about 1500 years (Clark and Stephenson 1975), in which case it could result from an explosion observed in AD 373. However, the remnant may also be considerably older (Downes, 1984). 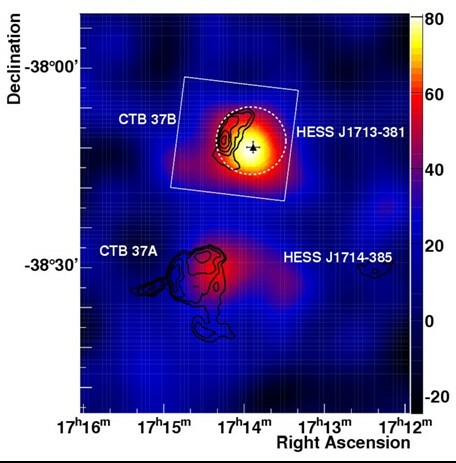 The source HESS J1713-381 coincides roughly with the inferred center of the CTB 37B remnant (Fig. 1). The gamma ray source has a (rms) size of 2.6', which is a bit smaller than the point spread function of the HESS instrument but still recognizable as an extended source, and not inconsistent with a emission from a filled 5' shell. The gamma-ray spectrum extends from a few 100 GeV to a few TeV, with a spectral index of about 2.7. The observation of very high energy gamma rays from a location roughly consistent with the center of the CTB 37B shell prompted X-ray observations with Chandra, performed in Febrary 2007 for 26 ks. The Chandra image (Fig. 2) reveals 18 X-ray point sources, with the strongest source (#1) located within the supernova shell, a few arc-minutes from the centroid of the gamma-ray source. When the point sources are subtracted, significant diffuse emission is revealed in addition, with a roughly Gaussian profile of about 1.2' width, and peaking close to the X-ray source #1 (Fig. 3). Energy spectra of source #1 and of the diffuse emission differ in character: source #1 exhibits a non-thermal power-law spectrum, whereas the diffuse emission from the region close to the shell is dominantly of thermal nature, with a characteristic temperature of 0.8 keV. The absence of diffuse non-thermal (synchrotron-)emission argues against identification of source #1 as a neutron star surrounded by a pulsar wind nebula of high-energy electrons; more likely, the diffuse X-rays represent thermal emission from shock-heated gas. The combination of temperature and size of the remnant speak for an age around 5000 years, disfavoring an association with the supernova of AD 373. An older age is also implied by the size of the remnant: the 10 pc size combined with a modest 1500-year age would require very fast expansion into a low-density ambient medium of only 0.05 atoms/cc, whereas a strength of the thermal emission implies densities of a few atoms/cc, at least in the visible parts of the shell. In this scenario of an older remnant, the most plausible source of the very high energy gamma rays are decays of neutral pions which are created when shock-accelerated nuclei collide with ambient gas. Fig. 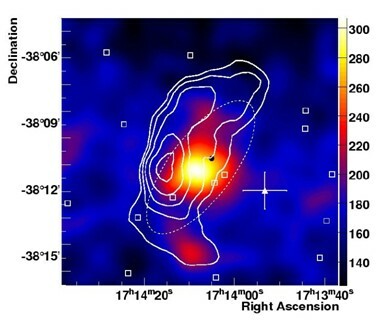 1: Enlarged view of the gamma-ray sky map of the CTB 37 superniva remnant complex. The color scale gives the gamma-ray flux, black contours show the radio emission from the Molonglo survey (Green et al. 1999), indicating the remnants CTB 37 A / G348.5+0.1 and CTB 37 B / G348.7+0.3. The dashed circle gives the estimated size and position of the second remnant. The cross illustrates the center of the gamma-ray emission. Fig. 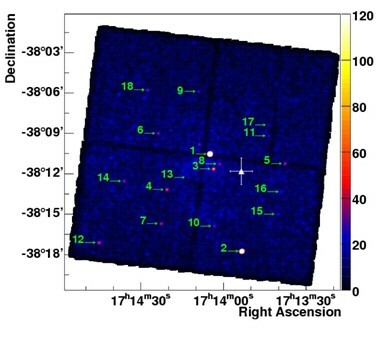 2: Chandra X-ray image (1-5 keV) of the region indicated by the box in Fig. 1, with 18 detected X-ray point sources. The cross indicates the center of the gamma-ray source. Fig. 3: X-ray image after subtraction of the point sources (with locations shown as square boxes), and after smoothing, emphasizing the diffuse X-ray emission from regions close to the remnant shell, which is indicated by the white contours. The X-ray source #1 is indicated by the black square.